Ok the Chevelle has shorty mufflers to a dual 2.5" h-pipe with flowmaster 40 or super 44 mufflers. I plan to convert this to a x pipe for starters but I really want the quietest I can go with out making a large performance sacrifice. Is this possible to be accomplished or is this going to end up being a compromise thing. I mostly drive the car to work and back and miss being able to hear the radio in the morning. I would go as quiet as I could get it and thought of putting the 307 emblems on the side and stripping off the SS emblems and changing the license plate to say Napping. EXHAUST NOISE is the result of UN DAMPED VIBRATION, or failure to control, dissipate and absorb the individual exhaust pulse strength. 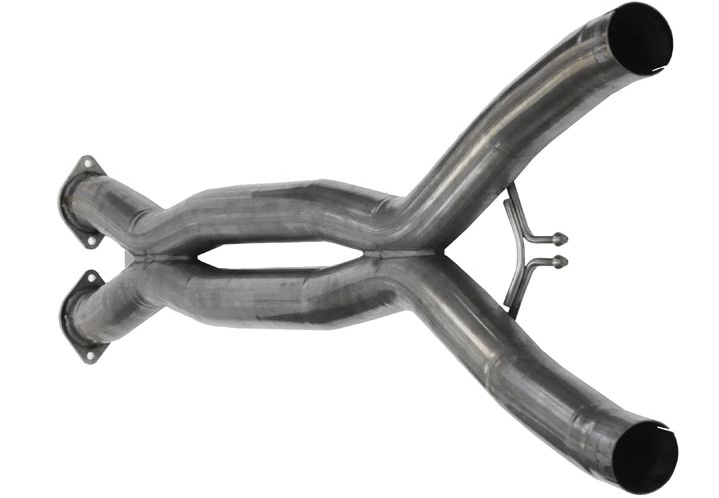 the use of an (x) pipe or ideally two (X) pipes allows you to split , equalize and dissipate the individual exhaust pulse from a single cylinder into two separate exhaust pipes and effectively double the cross sectional area , thus reducing both strength and velocity of the gases. Thats a good idea grumpy I like the whole double x pipe idea I read about will have to break out the measuring tape. I just googled the undercariage the double x is gonna be out of the question. 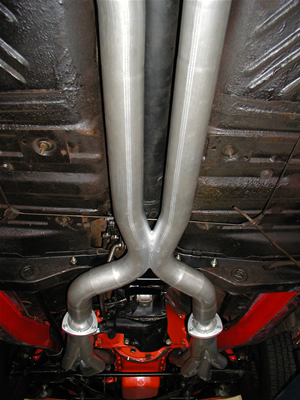 See if it will fit under there the other plan was x-pipe then two resonators into the mufflers. I also want to get away from the chambered muffler design as there seems to be a general sensus they drone more. I must say the drone right now is absolutely the worst right at highway speed. This is pretty much how my exhaust is except shorty headers because my father had pypes side pipes on the car for a while when he owned it. There is only 1 series of Muffler that I have used to meet your Criteria John. Walker Super Dynomax Oval Retangular case mufflers. Popular with Pontiac 400-455 guys with GTO & Firebird Trans Am. 2-1/2- 3 " Dual systems. 3 inch Will support 10- high 9 second cars Big block. Throaty when onhe gas hard. There was a Pontiac only muffler shootout 20 years ago. Walker Super Dyno Max gave same 1/4 mile ET adls Flowmaster 2-chambers. Walker Super Dyno Max gave same 1/4 mile ET as Flowmaster 2-chambers. 87vette81big wrote: There is only 1 series of Muffler that I have used to meet your Criteria John. Will look into these have heard good things about the borla XS mufflers also but I think I would have to run resonators with them to get them where I want them so the walkers would probably be the better option. I did find the borlas for dirt cheap on a site and they were the long ones also. 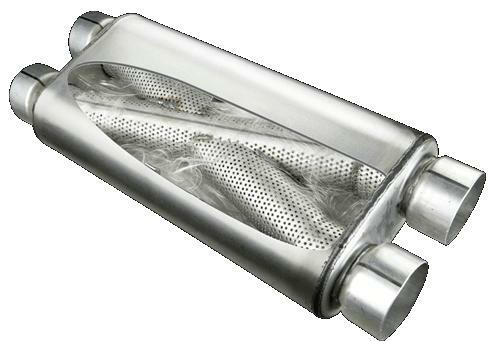 Borla XR Series is a Full Race Muffler. Be my choice 9-seconds & Faster. 4" or 5" inch duals. Fit Classic Musclecars & 5.0 Stangs best. No one here is running that fast yet. Walker Super Dyno Max is almost Whisper quiet. Been used on many 10-second ET Pontiac 428-455 Race machines. the walker and the borla are pretty much the names I have seen in all my searching over the past few days. THE dynomax mufflers with the valve have a reputation for rattling like a tin can full of marbles with a radical cam and true dual pipe muffle exhaust, the rattle is the result of individual exhaust pulse flow from individual cylinders reaching and rapidly forcing an opening in the one way exhaust flow gate valve, that opens as the exhaust volume of gas flow hits it and forces it open,then momentarily wanes (is reduced) the gate closed as the spring forced it closed,(SEE PICTURE) resulting in the rattle as the exhaust flow mass is far from consistent. 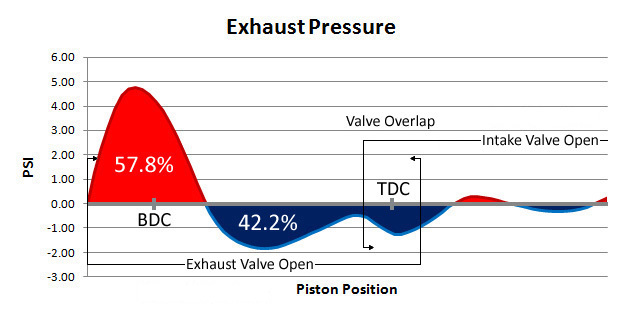 the exhaust pressure pulse splits its flow and significantly reduces back pressure as the pulse enters the (X) as its effective cross sectional area almost DOUBLES , dropping that back pressure almost in half at that point, which usually increases cylinder scavenging potential of tuned headers, and increasing higher rpm power if used, and usually reducing noise as the frequency is disrupted, inducing a mellower tone. 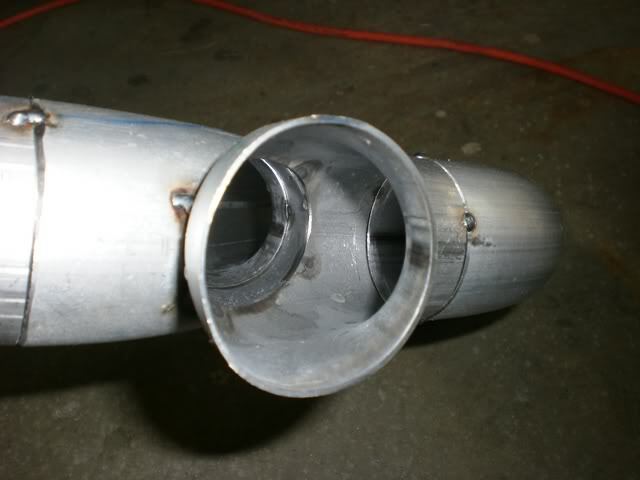 mounting a dual (X) PIPE tends, to reduce the individual exhaust pulse flow mass and energy, the (X) pipe in front of the muffler tends to greatly reduce the individual pulse strength and velocity by dividing and slowing the flow as the internal cross sectional area rapidly increased and even out the flow as it hits the flow gate, having two in a series works even ore effectively. The original Walker Super Dynomax Mufflers. No Gizzmo trap door valves. The Long case 21"-24 " length oval retangular mufflers. But do fit 1967-81 Camaro Firebird Trans Am. 1959-78 Full size Pontiac & Grand Prix. Installed you will only hear the Roller Rockers, Drive accessory belts turning, and the 5-cycle Camshaft in action. 20 feet away you would be hard pressed to tell the car is running. Only Summit Racing carries the original Super Dynomax. Backfire & explosion proof like a Flowmaster Race muffler. Won't take $500-1,000 to buy & install other systems. yeah the whole trap door thing not sold over complicating it I feel sounds like something to go wrong or sound annoying. Even though my r6 had a flapper built into the exaust to tune for more low end power and torque. But it was actuated to move but it was also a 16000 rpm redline from the factory. I accuse it for making cars seem slow to me. Cheapest way to go quick and fast no feeling like dragging knee on an off ramp at 80mph. Hence why I do not own it any more. I was making it into a track only machine because of my bad habits. Never was into wheelies or stoppies or the other stupidity. But I knew it had to go cause on the road it was only a matter of time at least on the track you don't have to worry bout cars. But with the little one I opted to get rid of it all together.